Spring is here and along with flower buds and blooming trees comes a dusty yellow coating of pollen. For many people, this time of year means sneezing, congestion, runny nose and red, watery, itchy eyes that occur when the body’s immune system overreacts to pollen and mold spores in the air. If you are suffering from symptoms of seasonal allergies, here are some tips to help ease your misery during the spring allergy season. 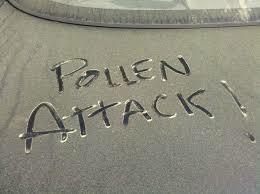 • Avoid going outdoors as much as possible when pollen counts are high and when wind blows pollens around. • Wear sunglasses or eyeglasses when you are outdoors to help protect your eyes from pollen. • Keep the windows in your home and car closed and use air conditioning. Consider purchasing an air purifier for your home and an allergen-trapping filter for your heating/cooling system. • Take off your jacket, hat and shoes when you enter the house to avoid bringing pollen inside. • Shower before bed to rinse away pollen from your hair and skin. • Don’t rub itchy eyes! Eye rubbing releases more histamine and makes your allergy symptoms worse. • Cut back on your contact lens wear. The surface of contact lenses can attract and accumulate airborne allergens. If you still need relief from your season allergy symptoms, you may find an over-the-counter remedy effective. Artificial tears help relieve eye allergies temporarily by washing allergens from the eye. They also relieve itchiness, redness, irritation and redness caused by allergies. If your eye allergy symptoms are relatively mild, over-the-counter eye drops may work well for you and be less expensive than prescription eye drops or other medication. Over-the-counter decongestant eye drops (with or without antihistamines) can help reduce redness in the eyes from allergies. If the decongestant eye drops you choose include an antihistamine, they can relieve itchiness as well. Decongestant eye drops should not be used for more than two to three days. Longer-term use can increase your irritating symptoms. Oral antihistamines may be somewhat helpful in relieving itchy eyes, but they can make eyes dry and even worsen eye allergy symptoms. If over-the-counter remedies do not relieve your allergy symptoms, ask your eye doctor about prescribing a stronger prescription medication. 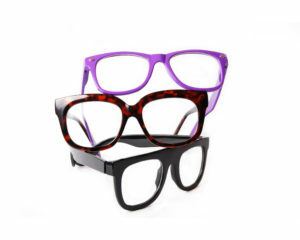 Offer valid through June 30, 2019 in the Optical Shops at any of our three convenient locations. CLICK FOR A PRINTABLE COUPON or mention the offer. *Can not be combined with insurance or package pricing. Not valid for Maui Jim, Costa del Mar, and sports packages. Other restrictions may apply. Using cutting-edge technology, Shamir Autograph Intelligence™ is the first no-line progressive lens to use patient experience, visual behaviors and artificial intelligence, to create the most customizable progressive lens design. Until now, all progressive lenses have been designed the same, no matter what your Visual Age™. Your Visual Age™ is the add power of your reading prescription and generally correlates with your age. As you get older, you will typically need increased power in your reading prescription. For example, a patient with an add power of +3.50 is typically older than a patient with an add power of +.75, and their lifestyles and daily visual needs are quite different. Extensive research has shown that based on their age, patients have different visual behavior related to driving, computer use, smartphone/tablet use and printed reading materials. Autograph Intelligence lenses have customized visual zones to match these visual preferences. The Optical Shops at all three of Columbia Eye Clinic’s convenient locations carry the Autograph Intelligence™ lens. Drop in to one of our Optical Shops to learn more or call (803) 779-3070 to schedule an appointment for an eye exam with one of our physicians. Simulation of progression of AMD. controls the sharpness of your vision. Macular degeneration is the leading cause of vision loss among people over 50 years old. The disease typically is marked by slow, painless loss of central vision, although in rare cases, vision loss can be sudden. Signs of vision loss from AMD include shadowy, wavy or blurred vision. Although peripheral vision will still be normal, because the deteriorating macula is responsible for fine details, AMD will impact your ability to read, recognize faces, drive, watch television, and use a computer. Your ophthalmologist can detect early signs of macular degeneration before symptoms occur, highlighting the importance of regular eye exams. In the early to intermediate stages of AMD, you will not experience vision loss, but your doctor can diagnose the condition by the presence of yellow protein deposits beneath your retina, called drusen, as well as pigment changes in the retina. 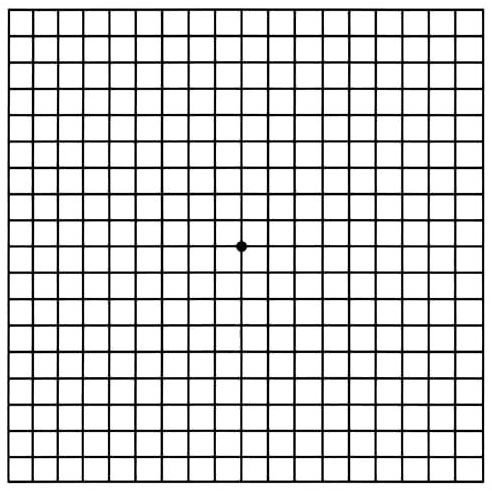 A testing tool called an Amsler grid may also be used to identify problem spots in your field of vision that may not otherwise be obvious and indicate a need for further testing. AMD is diagnosed as either “dry” or “wet”. The dry form is more common, accounting for about 80% of people diagnosed. 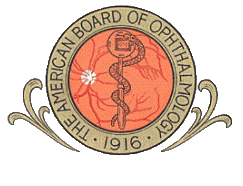 In this form of the disease, aging and thinning of macular tissues, depositing of pigment in the macula, or both, result in the slow loss of central vision. There are currently no FDA-approved treatments for dry AMD however, your ophthalmologist can advise if you may benefit from taking daily vitamin and mineral supplements. Wet AMD is a less common progression of dry AMD to a more damaging form of the disease. Wet AMD is when abnormal blood vessels grow under the retina and leak blood and other fluid causing scarring that results in irreversible blind spots in central vision. Vision loss is accelerated at this stage of the disease. There are medications administered by a very slender needle that can help treat wet AMD by reducing the number of abnormal blood vessels in the retina as well as slow leaking from blood vessels. Laser surgery may also be used to treat AMD in some patients. How Can I Protect Myself from AMD? Use the grid once a day, every day. 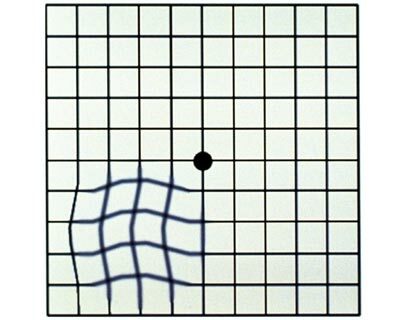 For someone with AMD, an Amsler grid may appear to have lines or areas that look blurry, wavy, dark or blank. 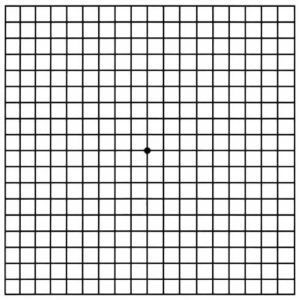 When used correctly, the Amsler grid can show problem spots in your field of vision. 1. Wearing the glasses you normally use to read, hold the grid 12 to 15 inches away from your face in good light. 3. Look directly at the center dot with your uncovered eye and keep your eye focused on it. 4. 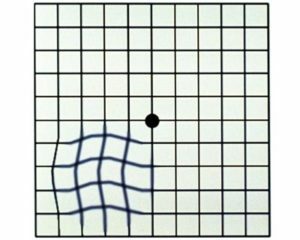 While looking directly at the center dot, notice in your side vision if all grid lines look straight or if any lines or areas look blurry, wavy, dark or blank. 5. Follow the same steps with the other eye. Amsler grid courtesy of aao.org. Downtown – 1920 Pickens St.
Lexington – 100 Palmetto Park Blvd. Northeast – 100 Summit Centre Dr.
Close at Noon on 12/21. Closed December 24th through December 27th.